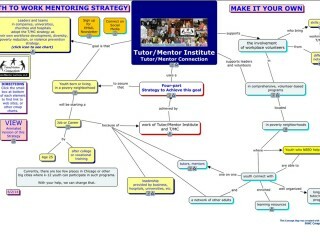 I’ve been using free CMap tools (http://cmap.ihmc.us/) for nearly 10 years to communicate strategies for helping kids in high poverty areas get extra help to move through school and into jobs and careers. CMaps are one of a growing number of free concept mapping platforms, so don’t be limited by this. A CMap has layers of information. So while the first layer might have a simple diagram.The maps each node points to may get more and more complex as people dig deeper. This spring, to help people see the variety of maps I’ve created, I launched a web page, showing most of my maps in thumbnail images, with links to the actual maps. I think this type of mapping of problems and solutions could be taught in schools throughout the world, as a form of deeper learning, and community service. The maps could become an archive that future students build on from year to year. It’s something they could return to as adults. Try it. Share the maps you create in blogs, as I do. This work by Daniel F. Bassill is licensed under a Creative Commons Attribution 4.0 International License.